Bhí mé ar Radio na Gaeltachta inniú ar Iris Aniar le Éibhlín Ní Chonghaile. Tháinig sí ag an teach cupla seachtain ó shin lena cuid páistí álainn, chun labhairt faoí céard a chuirim insteach i mboscaí lón na caillíní. Ach ar nós gach ‘chat’ maith, thosaigh muid ag caint ar neart eile agus thíos faoí tá an taifeadadh a tháinig as. An cineál bean a chloiseann sibh ar an radio, sin go díreach an cineál bean í Éibhlín – tá sí faoir eascamh labhairt leí…tá sí álainn. Ghlaoigh sí orm i ndhiaidh an clár agus d’inis sí dhom go raibh cúpla duine ag cuardach an oideas nó ‘recipe’le haghaidh an cáca baile. Tá an recipe seo thíos, chomh maith le link don píosa ar an radio agus téacs an sean alt a chuir mé suas ar an mblog. Bhí an téacs sin i mbearla agus tá brón orm nach mbeidh cuid agaibh in ann é a leamh. Cur an oigheann ag 180⁰C, 350F nó gás marc 4. 3/4 L bainne gear (Cuinneog más féidir leat) – is garmheastachán é seo. Cuir i ndótháin isteach chun meascán fluich a dhéanadh ach meascán nach mbeidh ag rith amach as an mbabhla. Cuir neart margarine ar an dhá tin and cuir na chácaí san oigheann ar feadh 35 noiméad. Seiceáil na cácaí ag an bpointe seo agus cuir isteach san oigheann iad arís gan an tin an t-am seo. Bá cheart go mbeadh na cácaí réidh ag 45 noiméad. Seiceáil go bhfuil fuaim folamh ag teacht uathu. Clár radio Iris Aniar a bhí air an aer inniú le fail ANSEO – tosaíonn an píosa ag 26 noimeád. The other day as I made cáca baile using my grandmother’s recipe, I was transported back to when I was about six or seven to her back kitchen, standing at her elbow in front of the window with my sister at the other, watching her stir her cake with her wooden spoon. I can see it and smell it. A product that is pure and from the land. 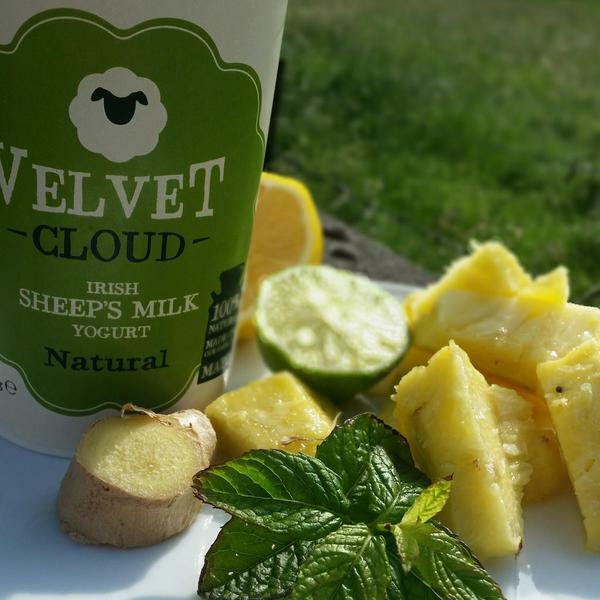 Velvet Cloud is a sheep’s milk yogurt made by the Flanagan family in Rockfield, Claremorris. Why would you go to the trouble of milking sheep you ask? Especially when considering the relatively small milk yield of the sheep in comparison to the massive yield of the cow. Sheep’s milk is naturally easier to digest than cow’s milk. The milk has small fat globules which mean that it is naturally homogenised and therefore creamier. It also has medium-chain fatty acids which allow sheep’s milk to be digested more rapidly – it takes 30 minutes to digest sheep’s milk compared with 2 hours for cow’s milk. As well as all that, sheep’s milk wins hands down in terms of nutrition when compared with cow or goat’s milk: higher in protein, Vitamin C (a whopping 10.3mg per cup), Vitamin B12, Folate, Calcium (almost twice that of cow’s milk) and magnesium (twice that of cow’s milk also). It is also lower in lactose which might suit people that have mild lactose intolerance. And now for the taste test – sheep’s milk is divine! It’s super creamy and mild. So why are we not drinking more? I suppose, if you are going to milk an animal for a living, you are more likely going to milk a cow which would give on average across the seasons 20 litres of milk a day. A sheep will produce 1 to 2 litres per day. The Flanagan family decided to go with the nutritionally better sheep’s milk and decided they were going to do something special with their product. It takes dedication to milk sheep. Apart from the lower yield, they are naturally prey animals so the ‘let down’ reflex can be affected if startled and therefore milk production. But the Flanagan family on their farm in Rockfield have been milking sheep and working on getting their yogurt, Velvet Cloud, just right over the last three years. Michael and Aisling spent over a decade living in France and Italy where they saw the popularity of Sheep’s milk products. On returning to Ireland they noticed the marked absence of it in a country where sheep thrive on luscious green grass. The idea of Velvet Cloud was born. Aisling and Michael started selling their yogurt in mid June 2015 when they quietly launched it on their twitter and Facebook pages. The response was instantaneous. They experienced astounding interest from chefs and retail outlets as they had hit on an obvious gap in the market and also had produced a deservedly well received delicious product. The couple have not been daunted by the massive interest since June and their yogurt is now available across the country in shops as well as on menus. 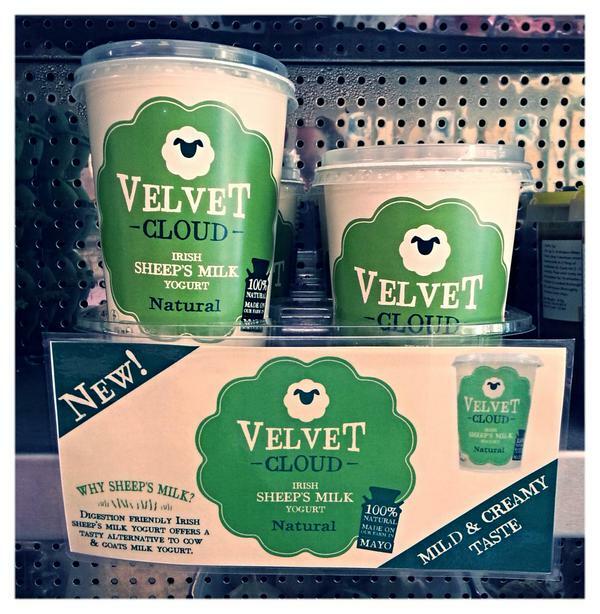 In Dublin, the yogurt is available in Caviston’s in Dalkey and Morton’s as well as the following markets: The Temple Bar market, Honest2Goodness Market and the People’s Park Market, Dunlaoire. Down here in the West it is available in Morton’s and McCambridge’s in Galway, and Rua and De Búrca’s in Castlebar, O’Connor’s SuperValu Westport, SuperValu and The Food Store in Claremorris to name a few, as the list is growing daily. It is featuring on many menus including the Michelin starred Aniar in Galway. I love these stories of people who have put in such hard work over years developing and researching to the point where they have a product that they are really happy with, a product that is pure and from the land. Their yogurt is their sheep’s milk, milked on their farm and brought to the dairy on their farm where all that’s added to it are live yogurt cultures – that’s it! No sugar or preservatives, nothing else. It’s real food made on one farm from start to finish. And I love how they then tentatively let it out into the big world to see if something would happen only to find a great reception for a great product. In the space of a few months, their product has left their farm and is successfully reaching people all over the country. Aisling and Michael should be very proud of what they have achieved – proud and tired!